Being the only hybrid subcompact luxury crossover, the Lexus NX300h offers something as unique as its ‘out there’ styling. A 2.5-liter Atkinson cycle engine pairs with three electric motors to generate combined outputs of 194 horsepower. 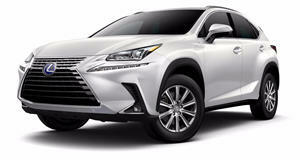 With motors on the rear wheels, the NX300h is all-wheel drive, and features a CVT transmission. The Comfort Package adds heated and ventilated front seats, auto-dimming mirrors, and blind spot monitoring with rear cross traffic alert. Other safety features include lane keep assist and forward collision avoidance. The blue detailing around the Lexus logo is a subtle hint to the electrification of the NX300h – the hybridized NX crossover. But beneath the origami styling, the angular, aggressive bodywork shares underpinnings with something a little more docile. This is the up-market version of the Toyota RAV4, and the mechanicals, oily and electrical, are all shared between the two models. Does that make the NX300h a more expensive version of a cheap car, or is the Toyota a bargain luxury crossover in workman’s overalls? For 2018, the NX gets a couple of tweaks, but it’s essentially the same as it has been since launch in 2014. 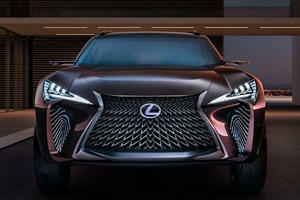 Those who buy the NX300h for its crazy exterior styling in the hopes the interior will be the same will be disappointed. Inside the design is more staid, though it’s a cool and contemporary look no one will fault. The materials look and feel rich, and the controls are laid out logically and intuitively with the exception of the infotainment system – or at least the one you get with navigation. It features the stupid Remote Touch trackpad we’ve bemoaned on other Lexus models, and in the NX300h, it’s no better. From a spaciousness perspective, all 5 potential occupants have ample room, even those in the rear, but it’s the stuff they carry that’ll be a problem. The angular rear windscreen eats into cargo volume in all models, but in the NX300h, the battery pack eats some space too, its 16.8 cubes trailing the rest of the class by some margin. The NX300h adds weight and complexity to the NX’s recipe – and it’s not better off for it either. Something this small is better suited to front-wheel drive applications, and the extra weight makes the NX300h feel cumbersome and slower than it is. The extra weight also adversely affects braking, which when paired with the gooey sensation delivered by the hybrid regenerative brakes, the act of slowing in an emergency or any other time isn’t pleasant. The ride comfort is decent, though nowhere near as h as we’ve come to expect from other Lexus models. It errs on the firmer side, and yet there’s still body roll in abundance. The suspension also doesn’t feel very precise; between that and the soulless steering, it feels very difficult to place the NX on the road in spite of its rather compact dimensions. The NX300h is in no way sporting, offering less than its Toyota-badged counterpart. Like most every Toyota or Lexus hybrid-drive car, under the hood of the NX300h you’ll find a 2.5-liter Atkinson cycle 4-cylinder engine. It pairs up with three electric motors – one doubling as a generator on the continually variable transmission and two acting to drive the rear wheels – with the two combining to generate maximum outputs of 194 horsepower. With all systems go, the NX300h is technically all-wheel drive – when the battery has juice. The EPA rates the NX300h at a combined 31 MPG, 6 better than the standard turbo variant. The hybrid NX is available in just one well equipped trim. Standard equipment includes automatic LED headlights, keyless entry, a rear-view camera, dual-zone climate control, power adjustable front seats, and Bluetooth. Several options packages are available adding various extra kit, with some standalone options also available. Tick the right safety-orientated boxes and you’ll get blind spot monitoring with rear cross traffic alert, rear park sensors, lane departure warning, adaptive cruise control, and forward collision mitigation. The NX300h scored five out of five stars in NHTSA testing, and was awarded as a 2017 IIHS Top Safety Pick +. It may be the only hybrid subcompact luxury crossover around, but that can’t stop us from judging it harshly. It’s a flawed machine after all – compromised cargo volume and disappointing ride and handling characteristics being the two biggest flaws. Other non-hybrid rivals offer more, with less fuss. Odd-looking. We were being polite.